John Wiley & Sons, Inc., branded primarily as simply Wiley in recent years (NYSE: JW.A), is a global publishing company that specializes in academic publishing and instructional materials. The company produces books, journals, and encyclopedias, in print and electronically, as well as online products and services, training materials, and educational materials for undergraduate, graduate, and continuing education students. Founded in 1807, Wiley is also known for publishing the For Dummies book series. In 2017, the company had 5100 employees and a revenue of $1.7 billion. On March 7, 2012, Wiley announced its intention to divest assets in the areas of travel (including the Frommer's brand), culinary, general interest, nautical, pets, and crafts, as well as the Webster's New World and CliffsNotes brands. The planned divestiture was aligned with Wiley's "increased strategic focus on content and services for research, learning, and professional practices, and on lifelong learning through digital technology". On August 13, 2012, Wiley announced it entered into a definitive agreement to sell all of its travel assets, including all of its interests in the Frommer's brand, to Google Inc. On November 6, 2012, Houghton Mifflin Harcourt acquired Wiley's cookbooks, dictionaries and study guides. In 2013, Wiley sold its pets, crafts and general interest lines to Turner Publishing Company and its nautical line to Fernhurst Books. HarperCollins acquired parts of Wiley Canada's trade operations in 2013; the remaining Canadian trade operations were merged into Wiley U.S.
Wiley's Professional Development brands include For Dummies, Jossey-Bass, Pfeiffer, Wrox Press, J.K. Lasser, Sybex, Fisher Investments Press, and Bloomberg Press. The STMS business is also known as Wiley-Blackwell, formed following the acquisition of Blackwell Publishing in February 2007. Brands include The Cochrane Library and more than 1,500 journals. Wiley partners with GreyCampus to provide professional learning solutions around big data and digital literacy. Wiley has also partnered with five other higher-education publishers to create CourseSmart, a company developed to sell college textbooks in eTextbook format on a common platform. In 2002, Wiley created a partnership with French publisher Anuman Interactive in order to launch a series of e-books adapted from the For Dummies collection. In 2013, Wiley partnered with American Graphics Institute to create an online education video and e-book subscription service called The Digital Classroom. In 2016, Wiley launched a worldwide partnership with Christian H. Cooper to create a program for candidates taking the Financial Risk Manager exam offered by Global Association of Risk Professionals. The program will be built on the existing Wiley efficient learning platform and Christian's legacy Financial Risk Manager product. The partnership is built on the view the FRM designation will rapidly grow to be one of the premier financial designations for practitioners that will track the growth of the Chartered Financial Analyst designation. The program will serve tens of thousands of FRM candidates worldwide and is based on the adaptive learning technology of Wiley's efficient learning platform and Christian's unique writing style and legacy book series. In 2016, Wiley started a collaboration with the open access publisher Hindawi to help convert nine Wiley journals to full open access. In 2018 a further announcement was made indicating that the Wiley-Hindawi collaboration would launch an additional four new fully open access journals. On January 18, 2019, Wiley signed a contract with Project DEAL to begin open access to its academic journals for more than 700 academic institutions. It is the first contract between a publisher and a leading research nation (Germany) toward open access to scientific research. A 2013 lawsuit brought by a stock photo agency for alleged violation of a 1997 license was dismissed for procedural reasons. A 2014 ruling by the District Court for the Southern District of New York, later affirmed by the Second Circuit, says that Wiley infringed on the copyright of photographer Tom Bean by using his photos beyond the scope of the license it had purchased. The case was connected to a larger set of copyright infringement cases brought by photo agency DRK against various publishers. A 2015 9th Circuit Court of Appeals opinion established that another photo agency had standing to sue Wiley for its usage of photos beyond the scope of the license acquired. In 2018, a Southern District of New York court upheld the award of over $39 million to Wiley and other textbook publishers in a vast litigation against Book Dog Books, a re-seller of used books which was found to hold and distribute counterfeit copies. The Court found that circumstantial evidence was sufficient to establish distribution of 116 titles for which counterfeit copies had been presented and of other 5 titles. It also found that unchallenged testimony on how the publishers' usually acquired licenses from authors was sufficient to establish the publishers' copyright on the books in question. ^ "About Wiley" (Press release). John Wiley & Sons. 2008. Retrieved 2008-02-04. ^ "FORM 10-K" (PDF). John Wiley & Sons. Retrieved April 27, 2018. ^ a b c "News" (Press release). John Wiley & Sons. 2008. Archived from the original on 2008-04-19. Retrieved 2008-04-24. ^ Wilson, J. G.; Fiske, J., eds. (1900). "Wiley, John" . Appletons' Cyclopædia of American Biography. New York: D. Appleton. ^ "Wiley Opens Office in Dubai". ^ "High growth and emerging markets: a 21st century strategy" (PDF). ^ "Wiley Establishes Wiley Brasil Editora LTDA" (Press release). John Wiley & Sons. ^ "Wiley to Acquire Blackwell Publishing (Holdings) Ltd" (PDF) (Press release). John Wiley & Sons. 17 November 2006. Retrieved 2007-06-07. ^ "Scientific, Technical, Medical, and Scholarly (Wiley-Blackwell)" (Press release). John Wiley & Sons. 2008. Retrieved 18 July 2009. ^ "Wiley Acquires Inscape, a Leading Provider of DiSC®-Based Learning Solutions" (Press release). John Wiley & Sons. 2012. Retrieved 17 February 2012. ^ "Wiley to Divest Selected Publishing Assets" (Press release). John Wiley & Sons. 2012. Retrieved 7 March 2012. ^ "Wiley to Sell Travel Publishing Program" (Press release). John Wiley & Sons. 2012. Retrieved 13 August 2012. ^ "HMH buys John Wiley portfolio". Financial Times. 2012-11-08. Retrieved 2019-01-01. ^ "Wiley: Fernhurst Books Acquires Nautical Titles from Wiley's General Interest Consumer Publishing Program". Retrieved 2019-01-01. ^ "Wiley stops publishing Canadian business books: Roseman | The Star". thestar.com. Retrieved 2019-01-01. ^ "Wiley to Acquire Deltak edu, LLC Leading Provider of Online Degree Program Services" (Press release). Deltak. 2012. Retrieved 10 August 2014. ^ "Rittenhouse Quarterly Report" (Press release). Rittenhouse Book Distributors. 2008. Retrieved 2008-04-24. ^ "Logiciels : Anuman Interactive s'attaque au marché américain". lesechos.fr. ^ "Wiley, American Graphics Institute Launch the Digital Classroom". Publishers Weekly. 2013-03-19. Retrieved 2016-10-17. ^ "Wiley FRM - FRM Study Material & Exam Prep". Wiley FRM. ^ "Wiley Partners With Christian H. Cooper To Deliver Cutting-Edge Study Materials For FRM® Candidates Worldwide". PRWeb. ^ "2006 Annual Report" (Press release). John Wiley & Sons. 2006. Retrieved 2008-02-04. ^ "Wiley and Hindawi expand open access publishing collaboration". October 25, 2018. Retrieved 2019-04-02. ^ Kupferschmidt, Kai (January 18, 2019). "Groundbreaking deal makes large number of German studies free to public". Science. ^ "Wiley Custom Select" (Press release). Mark Logic. 2009. Archived from the original on 2010-12-24. Retrieved 2009-05-25. ^ "News" (Press release). John Wiley & Sons. 2008. Retrieved 2008-04-24. ^ "Wiley plans redundancies in the UK and Australia". Archived from the original on 2009-10-01. ^ "John Wiley to close Edinburgh facility". ^ "Minden Pictures, Inc. v. John Wiley & Sons, Inc". 2014-01-27. Minden is a stock photography agency that licenses photographs to publishers, including Wiley. [...] In 1997, Minden licensed a number of photographs to Wiley for use in several educational publications. Compl. [...] In the instant action, Minden alleges that Wiley infringed the copyrights in the licensed photographs by exceeding the limitations imposed in the licenses. ^ "JOHN WILEY & SONS, INC., Plaintiff/Counter-Defendant, v. DRK PHOTO, Defendant/Counter-Plaintiff". 2014-02-21. 998 F. Supp. 2d 262 No. 11 Civ. 5454(KPF) United States District Court, S.D. New York. DRK contends that its licenses with Wiley for the images at issue in these instances were limited in scope in terms of the print run, media, and/or geographic distribution, and that Wiley violated the license terms by printing more units than authorized, selling the photographs beyond the licensed geographic distribution areas, and/or using the photographs electronically without permission. [...] The record establishes that Wiley infringed on DRK’s copyrights for the Three Bean Instances. [...] Because Wiley has failed to raise any issue of material fact as to whether it exceeded the scope of its license for the Three Bean Instances, summary judgment is granted in DRK's favor for these instances. ^ Peter Leung (2018-02-20). "John Wiley Partial Photo Copyright Win Affirmed On Appeal". Intellectual Property on Bloomberg Law. ^ Thomas Long (2014-06-11). "Agreements with photographers did not give stock photo agency standing to sue for copyright infringement". Intellectual Property Law Daily. ^ Judge William H. Pauley, III (2018-08-17). "John Wiley & Sons, Inc. et al v. Book Dog Books, LLC et al". 448. Scorched-earth litigation ensued, including numerous discovery motions, followed by appeals of determinations made by the Magistrate Judge, and multiple motions for summary judgment (followed by motions for reconsideration). [...] Defendants now resurrect that argument, contending that no reasonable jury could find sufficient evidence of distribution for 116 works. [...] Defendants continued to purchase from sources that they knew sold counterfeits. [...] Further, the jury learned that Defendants kept inadequate records. [...] Defendants acknowledge that infringement can be established through circumstantial evidence. [...] Second, Defendants challenge the five works for which Plaintiffs did not present a counterfeit copy. However, the jury heard that Defendants had purchased copies of those works from Best Books World, a known counterfeiter [...] But deposition testimony revealed that those distributors considered Defendants to be one of the most prevalent suppliers of counterfeit books and had ceased doing business with Defendants based on their history of infringement. [...] Defendants assert that Plaintiffs failed to demonstrate ownership for thirteen titles, meaning that Plaintiffs failed to establish statutory standing to sue for those works. [...] In each instance, while the copyright registrations submitted in evidence identified someone other than Cengage or Pearson as the copyright holder, trial testimony established that the person or entity listed was either the textbook’s author or a publishing company acquired by Cengage or Pearson. Plaintiffs maintained that Cengage or Pearson were granted exclusive licenses for these works. Although Plaintiffs did not submit documentation, Cengage representative Jessica Stitt testified that Cengage owns or holds the exclusive license for every Cengage title. [...] Defendants never challenged this testimony, nor did they ask any questions regarding Plaintiffs’ ownership of these works. No contradictory evidence of ownership presented. The jury was entirely justified in concluding that Plaintiffs established ownership for all works. ^ Lindsay McKenzie (2018-04-09). "Publishers Win Big in Fake-Textbook Lawsuit". Inside Higher Ed. ^ "Supreme Court says copyright law does not protect publishers in discount re-sales". AP via Washington Post. March 19, 2013. Retrieved 2013-03-19. .
Moore, John Hammond (1982). Wiley: One Hundred and Seventy Five Years of Publishing. New York: John Wiley & Sons. ISBN 978-0-471-86082-2. Wright, Robert E.; Jacobson, Timothy C.; Smith, George David (2007). Knowledge for Generations: Wiley and the Global Publishing Industry, 1807–2007. 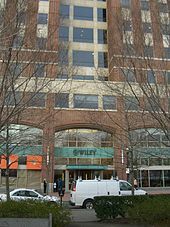 Hoboken, New Jersey: John Wiley & Sons. ISBN 978-0-471-75721-4. Munroe, Mary H. (2004). "John Wiley Timeline". The Academic Publishing Industry: A Story of Merger and Acquisition. Archived from the original on 2014-10-20 – via Northern Illinois University.